We left Anchorage without looking back, blasted some reggae tunes and hit the open road. About 40 miles outside of Anchorage, the view outside the window became jaw-dropping. Winding rivers opened into vast canyons with distant mountains around each corner. We uttered, “my god, it’s beautiful,” approximately 1000 times. What is most appealing about driving the Alcan, is the abundance of camping. You need not drive 20 minutes until you find the perfect roadside pullout to pitch a tent. Our first night we stopped near the Matanushka Glacier which I vowed to come back and visit. 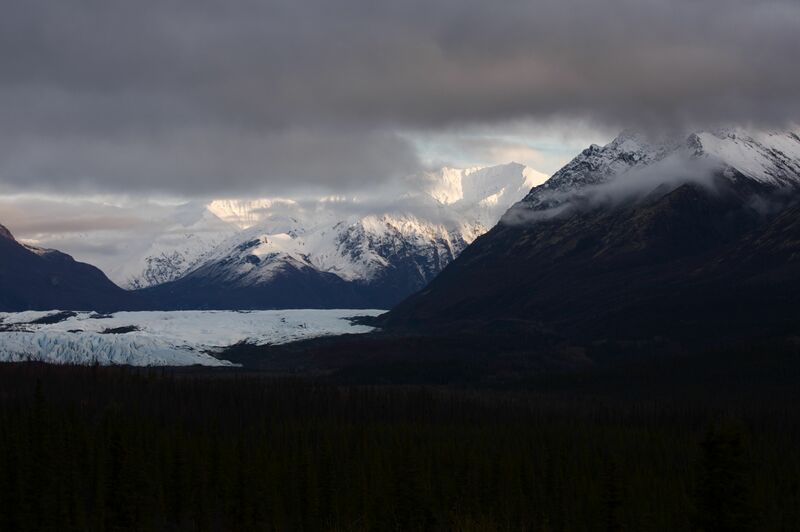 Matanuska Glacier is 26 miles long and 4 miles wide at its terminus. Classified as a valley glacier; a body of solid ice that flows like a river under its own weight through an existing valley. And it is gorgeous. About 10,000 years ago it retreated to its current location in the valley. Unlike many of the glaciers in Alaska which are receding rapidly, it has not seen significant change in mass for almost two decades. Don’t swerve off the highway when you drive past. After such a late start out of Anchorage, we decided to make some ground the next day and drove hundreds of miles toward the Yukon border. We arrived at Yukon customs, to an empty window with a sign that intimidatingly read, WE KNOW YOU ARE HERE. We waited patiently until a young border officer with a permanent frown on his face appeared. We readily handed our passports over. “How much currency do you have in your vehicle?” I responded that I had about 20 dollars US. He snidely said, “Well, that’s not going to get you through Canada.” I explained that we had plenty of money in our bank accounts and he let us through. Whew…perhaps something was lost in translation, through my thick American accent. 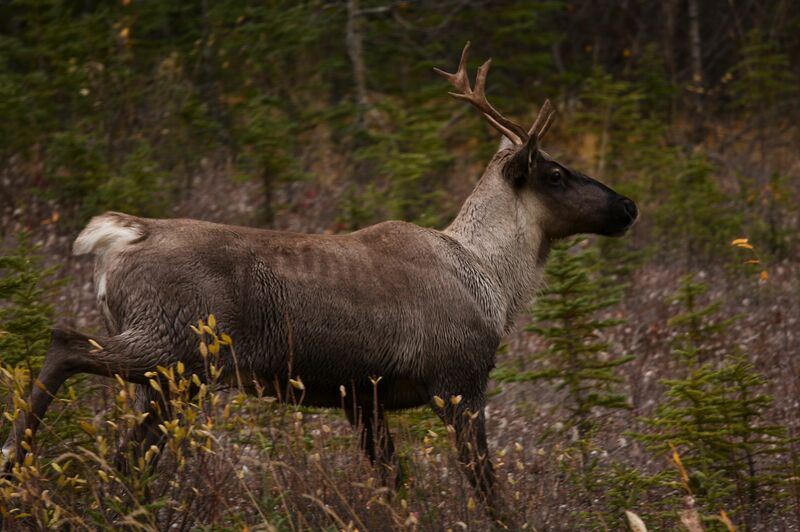 As we entered the Yukon, the beauty that surrounded us intensified. The change seemed almost immediate; the sun emerged from deep inside the cloudy sky, wildlife bounded along the roadside and strangers waved hello. We could almost faintly hear a soft whisper through the trees: “Oh, Canada!! !” We stopped for cold beers at Buckshot Betty’s. Delicious. Life seemed too good to be true. 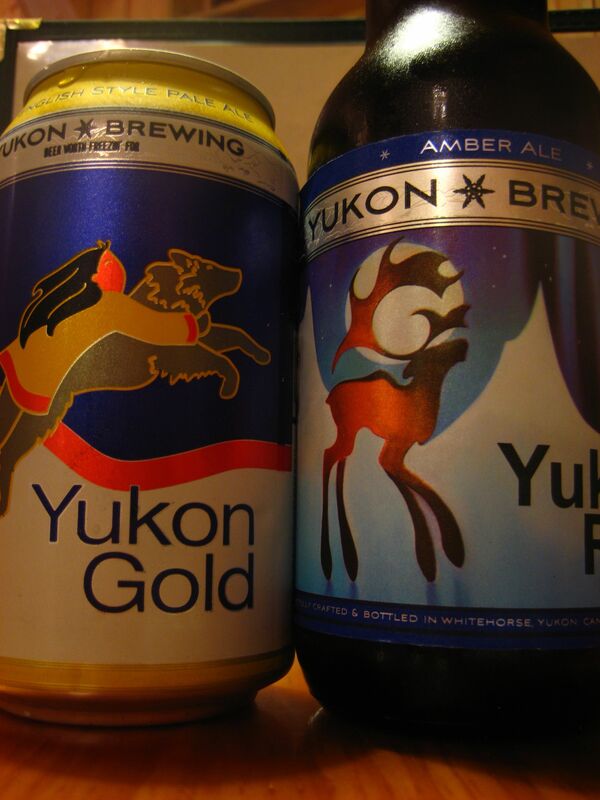 Taste of the Yukon, eh? And it was. Reality hit us hard as blue and red lights flashed in the rearview. Perhaps the cops are friendly in Canada and just want to say hello? Nope. 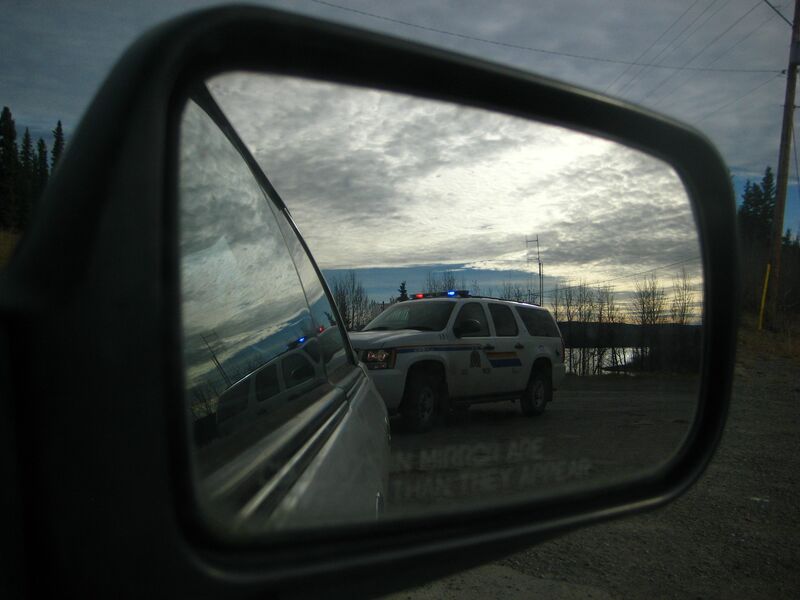 Busted for going 94 in a 75 kilometer per hour zone as we entered the town of Teslin. We sighed with relief as she handed us the ticket; the fine totaled $46.00. Sorry officer, the conversion of miles to kilometers per hour is really confusing. Oh it’s on my speedometer? As we drove deeper into the Yukon, we met a northern hawk owl on the road and visited a lake that hundreds of trumpeter swans inhabit for the winter. 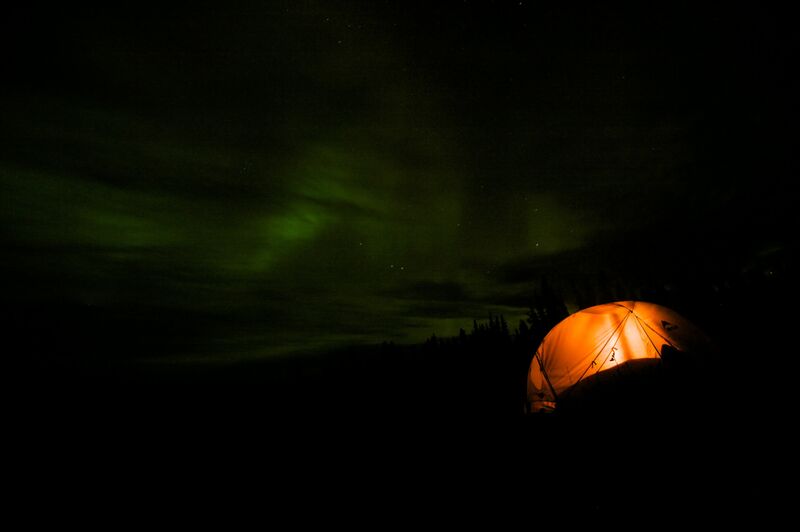 We camped on the edge of Kluane National Park (another location on my “must return” list). Around every turn was a lake that could be mistaken for an immense mirror with beautiful reflections of the overlooking mountains, lined with black spruce trees. As we prepared our tent, strange lights flashed across the sky. At first we thought, perhaps remnant light from the tiny town of Burwash Landing? Aliens?? Soon the lights were unmistakable. Aurora Borealis. The famed Northern Lights. They danced across the sky, other worldly spotlights emanating from behind the clouds. The lights covered the sky like soft green blankets sewn with stars. We spent a shameless hour ogling the sky, until the clouds finally won the celestial battle. Believe me folks, this picture does not do the Aurora justice. On day three, it was difficult, but we had to leave the Yukon and push on southward. We arrived late to set up camp in Liard Hotsprings Provincial Park. The sun of the Yukon began to feel further away as the rain came down and continued into the night. We awoke to more rain, rolled out of our sleeping bags and hurriedly made our way down the boardwalk to Liard Hotsprings. Liard is really the only stop we had planned, hearing from friends it is a must for weary highway travels. To our dismay, the main “Alpha” pool is being renovated. This upgrade began in August. I would recommend checking the website before making this your destination. BUT there is a secret. We went past the construction and found our way to the old “Beta” pool which has been permanently closed. Of course we wouldn’t break the rules and enter this forbidden pool, but if you must know it is nice and deep and hot. Note: when breaking the law, use your best judgement. 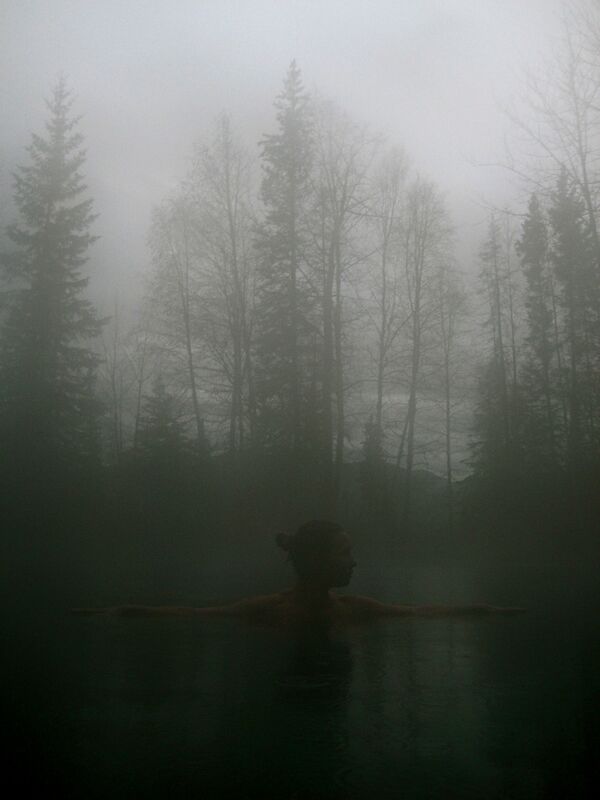 Liard hotsprings will cure what ails yah. The “Alpha” pool. The side not under construction. Currently, we are in Toad River. Population 75. Our journey has brought us 1193 miles. We have hit our breaks for moose, bear, bison, caribou, coyote and one marmot. No collisions yet: I knew my years working as a wildlife biologist would pay off. I can spot those suckers from a half mile with my naked eye. This guy decided to run across the road as we drove by. We watch the snow accumulate, finish our hot coffee and reluctantly hit the road before the snow begins to stick. 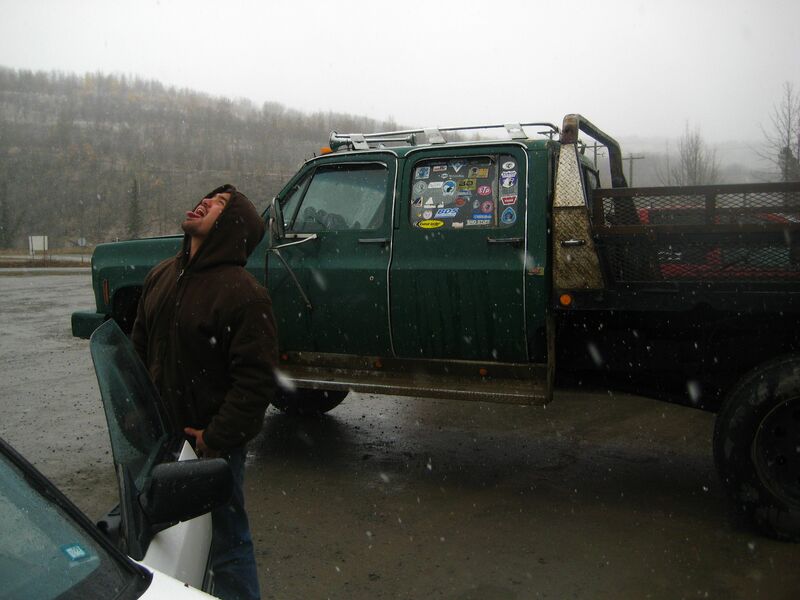 Shawn instinctually catches snowflakes on his tongue in his first snow fall. Am glad to hear from you, was beginning to worry. ShawnY finally gets to see snow huh. Left NT Lani’s phone # on his phone. 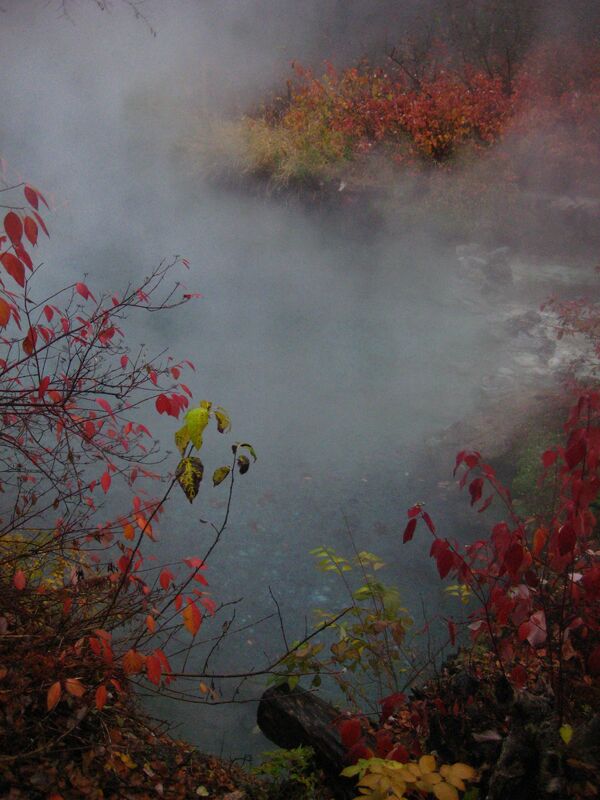 Amazing hot-spring shot! What an adventure!!! Ah I hope to visit Yukon one day! Your description of the stars behind the northern lights is perfect – something I hadn’t thought about before, but really struck me when I was lucky enough to see the lights in Arctic Norway.